This Skillet Chicken Pot Pie tastes like it’s been simmering all day, but it hasn’t. With a deliciously crispy puff pastry topping, your family is going to love these individually sized pot pies! A while ago I made a skillet beef stew. It was so good! But that recipe made me wonder what other recipes that are supposed to take ALL DAY to cook that can be converted into a skillet meal. Skillet meals are all the rage now a days. Or didn’t you know that? Yes! Skillet meals, sheet pan meals, one pot meals, instapot or Instant Pot meals, slow cooker meals. All of these are super popular. I guess they have been for a while. Who doesn’t want a quick, easy, and DELICIOUS meal on the table with no muss and no fuss? I know I could use an arsenal of those types of recipes. I’ve talked about being a food hoarder and the bread shelf, right? Well, this recipe sort of came about from something similar. You see, I think of these ideas for recipes all the time. And I sporadically purchase ingredients for these items. However, they sometimes just don’t get made and I’m stuck with the ingredients. Enter the freezer shelf full of puff pastry and pie crusts. I think, “I should make a pie!” Then I buy a pie crust and never make the pie. Then I think, “I should make a pie!” And then I buy the pie crust and never make the pie. You see where I’m going with this? On more than three separate occasions I have signed up for a baked brie, but never got around to making it. This explains the two boxes of puff pastry in the freezer. I simply forget I’ve purchased some and purchase more. I believe I’ve also talked about my crappy memory, too. So, there I was dreaming of the skillet beef stew and staring at the puff pastry in the freezer. Then it hit me! 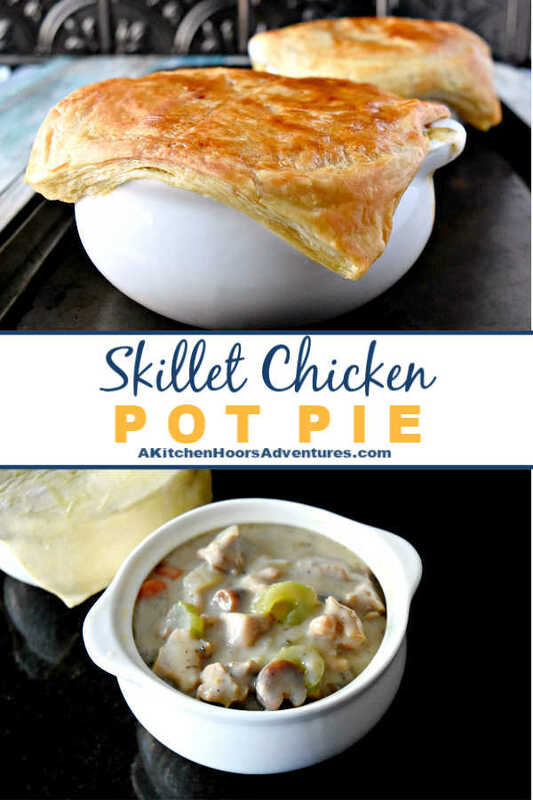 Skillet chicken pot pie! And no, not ones made in a skillet. I wanted individual ones because I have these really cool looking individual ramekins. I bought them for French onion soup. Yup. That’s the only reason I have them. I thought they would hold the perfect amount of deliciously creamy skillet chicken pot pie. They would also hold the perfect amount of puff pastry on top for that flaky experience that is a must with pot pie recipes. 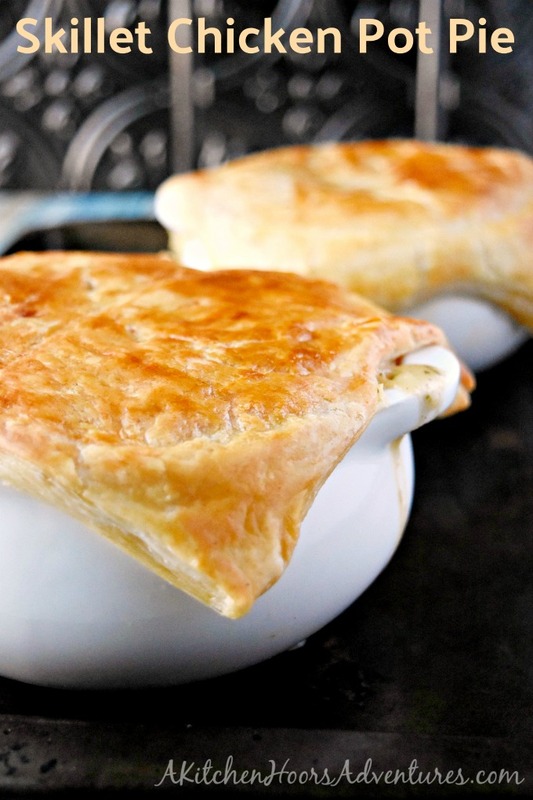 Granted, I’m a traditional double cruster with pot pies, but in a pinch this works really well!! 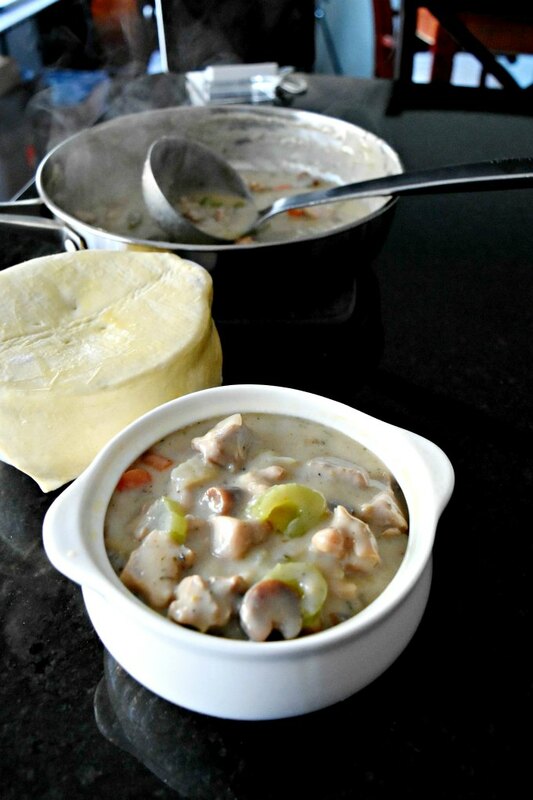 This skillet chicken pot pie recipe is easy. There’s maybe 10 or 15 minutes of hands on making the filling. The rest is baking to get the crust nice and flaky golden. I promise this is a simple and delicious recipe. It’s even easy enough for a weeknight meal. You could also make the filling before hand on the weekends and then top and bake. If you do this, make sure to bake a little longer or take the filling out to come to room temperature. I’d probably do the latter, so you don’t have to put foil on the crust to keep it from over cooking. Do you see that creamy goodness? Don’t lie to me. I know you’re drooling right about now. It tastes like all day flavor but in an easy and quick skillet version. All the herbs and spices, chicken broth, and heavy cream combine to make a rich and comforting filling for these individual skillet chicken pot pies. I am warning you, though. You might want to eat the filling by itself. And that’s perfectly fine! It’s your prerogative to do so. If that’s the case, double the batch because when you top it with the puff pastry and bake it you’ll be glad you double the recipe. Just look at all that puff pastry goodness holding that creamy skillet chicken pot pie filling inside. Shhhhh. You hear that? It’s the sound of your spoon breaking through that crispy crust and digging into the chicken. It’s the sound of ah-mazing about to hit your lips. And, it’s also the sound of your family thanking you for making such a hearty and comforting meal. So, you might want to double the batch and freeze half for later. Your family will ask for this repeatedly so having some of the filling and puff pastry on hand means you can whip them up in no time. You know, that’s not a bad idea. I might have to try that! I’m glad I thought about it. I admit, it did cross my mind to just keep this as like a chicken chowder. And, well, it might show up again as that in a few months or so. Because, well, just look at all that hearty, delicious, creamy goodness!! Whether your bowl is topped with puff pastry or not, it doesn’t matter. That is one pan of creamy rich skillet chicken pot pie goodness right there. 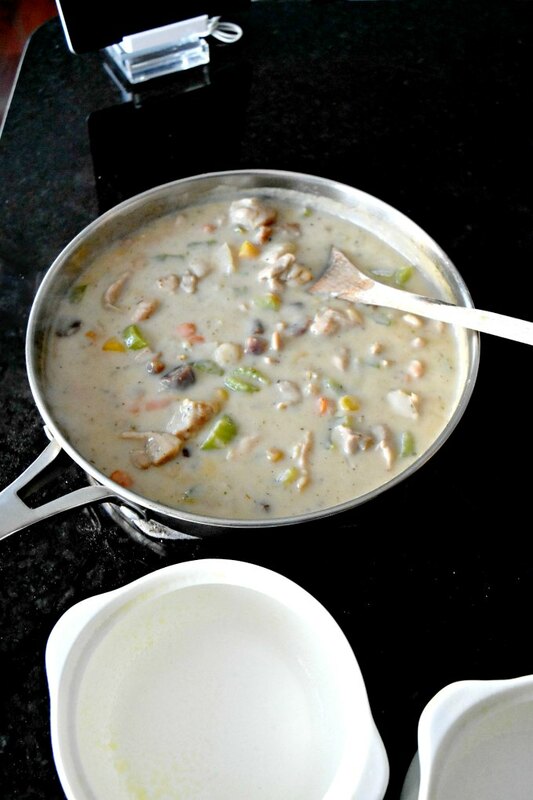 If you wanted to make this as a chowder instead, I’d just double the recipe? Maybe toss in some wild rice or some potatoes. That would be delicious. I love the thought of the wild rice added to this creamy goodness. That might have to show up on the blog as some point, too. I love that golden crust! You know it’s going to be flaky delicious. 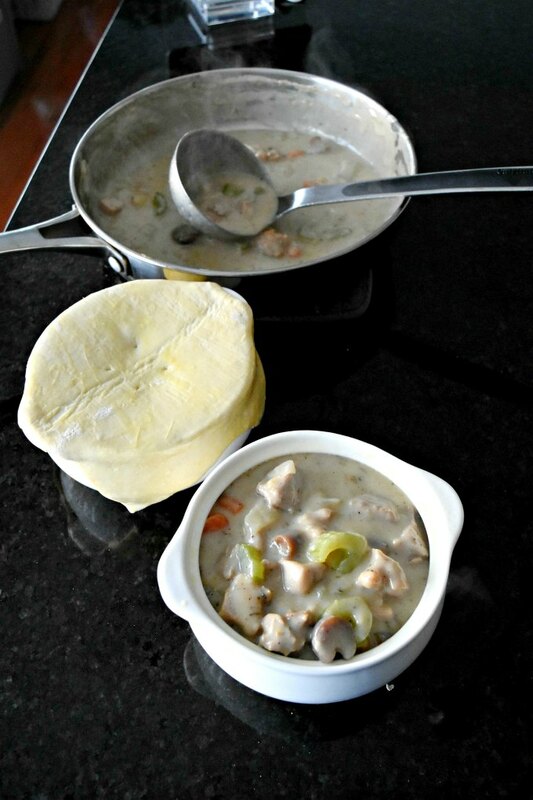 I took those corners off and dipped them into the creamy skillet chicken pot pie goodness. It was like delicious toast points but it was puff pastry instead. Hmm…now there’s an idea! This post has created a few inspiring ideas for my blog. I should write more posts like this. Yes, I did vent the puff pastry. I didn’t want the filling to ooze out the sides of the bowl. I highly suggest doing this so the steam can escape and not build up. It will keep the pastry flaky and keep the filling inside your bowl. This is a hearty and comforting meal you can whip up any night of the week. It’s especially delicious on cold nights. Like some of deep freezer temperatures we had a week or so ago from that polar vortex. You need something warming and delicious on nights like that. This Skillet Chicken Pot Pie tastes like it's been simmering all day, but it hasn't. 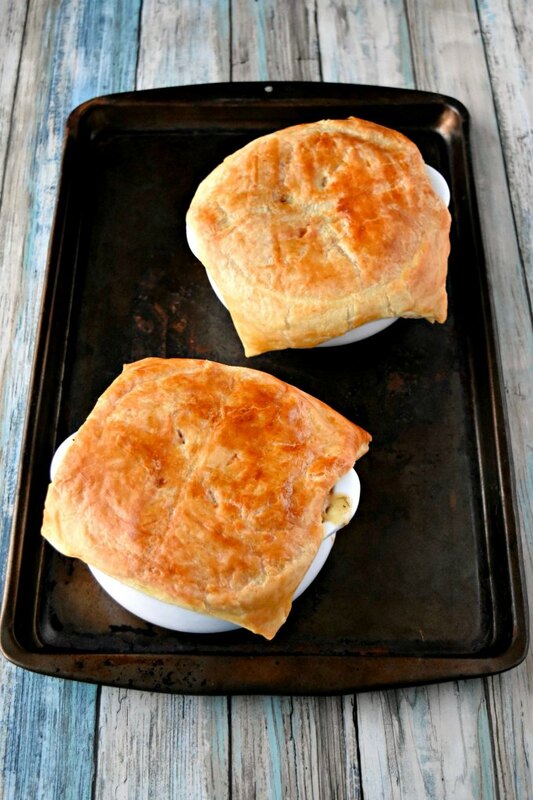 With a deliciously crispy puff pastry topping, your family is going to love these individually sized pot pies! Heat a large skillet over medium-high heat. Swirl the olive oil in the pan then brown the chicken. Add the celery and cook until it begins to soften; about 3 to 5 minutes. Stir in the rosemary, thyme, poultry seasoning, garlic salt, and black pepper. Pour the chicken broth and heavy cream over the mixture and simmer until the chicken is cooked through. Combine the water and flour in a small bowl with a whisk. Stir the slurry into the pan and cook until it thickens. Pour the mixture into 4 oven safe individual casserole dishes. Cut the puff pasty into 4 squares and top each casserole dish with a square. Brush with the egg and bake at 350 for 20 to 25 minutes or until the puff pastry is golden brown. Cool slightly before serving. I love any recipe that can be made in individual servings like this. They’re just so fun to eat! Aren’t they? You don’t have to share them at all. Love cooking with a skillet since you can start with the stove and transfer it directly to the oven! No extra dishes needed. I love this hack to simplify chicken pot pie. It is such a great recipe to serve on a chilly winter night. With the weather being what it’s been lately, I know that we’ll be enjoying this a lot. Thank you! It definitely warmed us up on a cold night or two. My nan used to make the best chicken pie. I am going to have to try this and hope it tastes the same! I hope you like it! It is creamy and delicious. I love the way you topped the pies. Now I want to make pies just so I can top them that way. I always spend too much time faffing around trimming it. Thank you! I didn’t trim it because I wanted the extra puff pastry to dip into the creamy pot pie goodness. Win win in my book! Chicken pot pie is one of my favorite meals. So hearty and comforting. I fall into the “I have too many pie crusts” category too.